In the early 1860’s John Bradshaw, a young man of Baptist persuasion had been preaching in Tandragee. Later he entered Spurgeon’s College, London to train for the ministry but died in April 1865, before his training was complete. In 1863 an application was submitted to the Committee of the Baptist Irish Society for a missionary to be sent to Tandragee so that the seed sown should be nourished and if possible a church of baptised believers formed. In response to this, on the recommendation of Pastor J. Douglas, missionary of the Baptist Irish Society, at that time stationed in Portadown and Pastor W. S. Eccles of Banbridge, a young man, John Taylor, not yet thirty years of age was sent to Tandragee. He and his wife had experienced personal salvation through faith in the Lord Jesus Christ during the 1859 Revival. ‘And sitting down they watched Him there”. (Matthew 27:36) At that time there was no meeting place, but very soon a room was acquired and made ready for meetings. The church was formed on 29th February 1864. The Duke of Manchester leased to them the piece of ground (1 rood 27 perches) on which an old building stood. The lease was for 91 years at 30 shillings (£1.50) per year. It was decided that the chapel be 60 feet by30 feet with walls of stone from nearby Tullyhue quarry. The slated roof was to be supported by pine beams and sheeted inside with pine boards. At first the amount of money collected enabled only the walls to be built, then the work ceased, but not for long. A generous thank-offering from a Mr E D Atkinson in recognition of his son’s success in a law examination in Dublin enabled the roof to be completed. During the building, water for mixing mortar was obtained from a well on the site. After a while the well dried up, which would have meant drawing water from the Cusher River a mile or more away. The members decided to hold a prayer meeting. During the night there was neither dew nor rain yet in the morning the well was full and there was no further shortage. The original plan was to put in small windows in the church, but Mr Henry White of White, Thomkins & Courage Ltd, who lived at Orange Hill close by, was passing. On seeing their intentions he shouted to Pastor Taylor, “Put in large ones”. Back came the answer – “we can’t afford them”. “Put them in and I’ll pay for them”, said Mr White. Towards the end of 1867, the Church was opened free of debt, although there was still some work remaining to be completed as late as 187l. The thank-offering received at the opening of the Church totalled £10 which was divided equally among the Missionary Societies of the Baptists, Brethern, Wesleyans, Presbyterians and the Church of Ireland. It was decided to build a manse, for which there was some money in hand. In November 1870 it was agreed at a church meeting to take up a thank-offering on the first Lord’s Day 1871 ‘to finish the work in connection with the Church and the house’. The total cost of the Church and manse was approximately £1000. The next project was to provide a burial ground. The minutes of 14 October, 1875 stated .- ‘That we obtain just as much ground as will afford ample accommodation for the burial of our dead and that we endeavour to have the whole property included in a lease’. The ground is now freehold as the Church was given the option of buying out the ground rent for £45. The Church building served the Fellowship well down through the years despite the fact that there were no modern conveniences such as kitchen and toilets except for dry toilets in the hedge at the back of the building. However, in the early 1950’s two toilets were built outside the back door. Further progress was made with the erection of kitchen and toilets for the centenary in February 1964. Another addition was the erection in 1976 of a wooden structure, which had been the old Elim church in Markethill.This building was used as a Church Hall. In 1987 the old manse was demolished and a new bungalow was erected. In 1988 the Baptist Building Committee was asked to look at problems the church was having with the windows, the roof, and dampness in the internal walls. The committee gave advice on the treatment of the walls, the replacement of the windows and the re-roofing of the building. The church even went so far as to get an estimate for the re-roofing job. However no action was taken at that time. The same Committee was asked to come back again in 1993. This time their advice was to demolish the existing church building and erect a new one on the same site. At the Annual Church meeting held on 28 February 1998 Mr Alan Mawhinney was suggested as a possible architect and he eventually undertook the job and submitted various drawings. 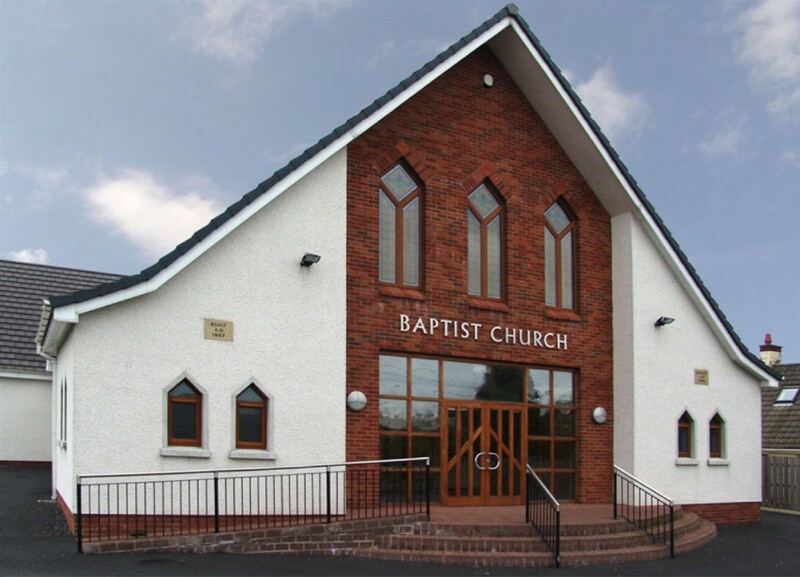 At a special church meeting held on 15 January 2000 to consider the Church Building Project, it was decided to go forward with the Church Building up to the limit of their financial resources. Eventually planning permission was given. At a special church meeting held on Wednesday 16 May 2001 under the chairmanship of the late Pastor Edward Betts, it was agreed to accept the tender submitted by Mr Sam McGowan. The church held its last service in the old church building on the afternoon of Lord’s Day 22 April 2001. At the beginning of May 2001, the old building was demolished. It was found to be long past its sell by date. It had no foundations, the pine beams were full of dry rot and some of the beams were resting on the wall above the windows without headers. The new building was opened.